We’d love your help. 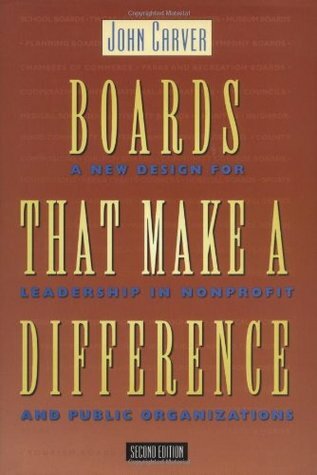 Let us know what’s wrong with this preview of Boards That Make a Difference by John Carver. To ask other readers questions about Boards That Make a Difference, please sign up. John Carver's work is a conundrum. In one way, his policy governance theory makes complete sense. Boards of directors of nonprofit and governmental organizations should focus on the big picture, on defining results, and leave operations (how to) to their staff. With this clear focus, boards no longer have to struggle with the question of where rubberstamping ends and micromanaging begins. They are working on their responsibilities and staffs are working on theirs, which are separate but compleme John Carver's work is a conundrum. In one way, his policy governance theory makes complete sense. Boards of directors of nonprofit and governmental organizations should focus on the big picture, on defining results, and leave operations (how to) to their staff. With this clear focus, boards no longer have to struggle with the question of where rubberstamping ends and micromanaging begins. They are working on their responsibilities and staffs are working on theirs, which are separate but complementary. This Policy Governance model is also packed with all kinds of mechanisms for making boards more productive, and therefore more high-achieving, than current commonly-accepted practices allow for. Truly, I would like to live in a world where boards of directors behaved as Carver describes. The problem is that they don't... and they won't. Few will accept Carver's insistence that the Policy Governance model be taken in toto. Unless and until an organization is in a free-fall, there is no motivation to adopt such a wholesale change in how they do business. At best, they will accept some suggested incremental improvements (especially, and ironically, if they come from a highly trusted CEO.) Some may say they have adopted Policy Governance, even go through the training and write some policies... but in the few cases I am familiar with in which this has happened, the boards soon revert to adopting outcome statements and plans that are put in front of them by staff, go back to organizing their meetings around agendas developed by the CEO. They may be effectively staying out of operations, but they wouldn't adopt a goal the CEO didn't want to save their lives. So Carver's model fails for lack of practical application. Which is too bad. I wish he had devoted his considerable talent and high-quality thinking to providing his readers with a series of ideas for how and when to use some of his techniques. He could have been a real help to consultants like me who support others to improve. Those of us on the ground working with modern nonprofits are successful at introducing new governance practices one at a time. I just don't see it working otherwise. For those of us that work for, with or serve on boards, this is truly refreshing. A good argument on how to organize a board. It is a little bit repetitive and cites himself a lot. Overall, I enjoyed the book, but it is not for everyone. Every board member should read this! For school but I ended up enjoying it because I didn't take it all at face value- more with a grain of salt, because the idealist way of Carver's thinking just doesn't happen. Although, those working in local government often wish that boards and committees would think this way! This book is vaguely interesting, but I really don't feel it is the best governance model for every board out there. Organizations with small staffs often don't have the luxury of confining the board members to policy-only roles. My dog's name is Daffy. I had to read this for work. I barely skimed it. Very painful. Sorry if you are reading/have read this. This is a very fine book on boardsmanship. Carver has an unrelenting grasp of the difference between principles and methods. Really fine work. Right idea...EXTREMELY boring - had to read for the Governing Board at the kids school. Fortunately I was reading this for a purpose. It reads like oatmeal, probably good for you but pretty boring. This book contains important ideas, but makes it sound too easy ... focusing on only the big ideas for board work.